eScan Internet Security Suite is a complete security suite which provides essential protection against viruses, objectionable content, hackers & privacy threats. Real Time Content Scanning for all kind of SMTP, POP3 & HTTP traffic.Remote Access File Rights, restriction of creation & modification of specific file types in user specified folder. Parental Control. Anti-Spamming. Automatic Daily Internet Updation.NetBIOS Firewall. 24/7 Support. 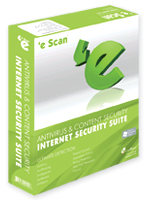 eScan Internet Security can Effective against virus, spyware, adware, keylogger. Novice or expert users! Both can navigate the New Graphical-User-Interface with ease. A Single-screen-access to both, the Virus-Monitor & On Demand Scanner. eScan-10 Scans, detects, Monitors & warns about changes in registry. It also warns about the applications suspicious in nature. All incoming /outgoing emails, attachments & websites are scanned for confidential data. Prohibited content, offensive and obscene language using specific keywords and phrases are also well scanned, using NILP, RBL and SURBL technologies. No data-thefts, virus infections through USB/Firewire based portable devices. Application Control: Block/Permit applications on networks/PCs. Advanced Firewall saves system from all network-based attacks. Qweas is providing links to eScan Internet Security Suite 11.x as a courtesy, and makes no representations regarding eScan Internet Security Suite or any other applications or any information related thereto. Any questions, complaints or claims regarding this application eScan Internet Security Suite 11.x must be directed to the appropriate software vendor. You may click the publisher link of eScan Internet Security Suite on the top of this page to get more details about the vendor.